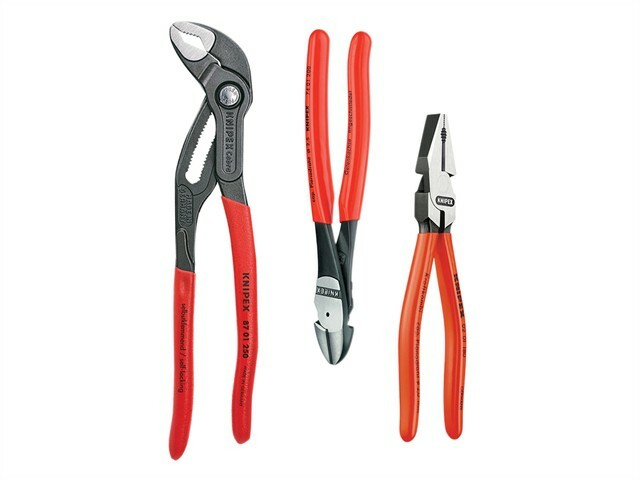 The Knipex 00 20 10 Plier Set contains KPX0201180 Combination plier: Ideal for soft, hard and even piano wire cutting with the strong durable edges, will make an easy and clean cut, with long lasting results even under the toughest conditions. KPX7401160 Diagonal cutting plier: Ideal for soft or hard wire ranging from 2.0mm up to 3.00mm across the range sizes, even piano wire cutting is a breeze to cut with the strong durable edges, makes an easy and clean cut, with long lasting results. KPX8701250 Cobra water pump pliers: Have automatic adjustment as these can be opened and adjusted directly at the work piece with one hand and then the cobra pliers close with a push of a button, this gives a good strong grip on any job application. Tool steel is oil hardened and tempered, with separately induction-hardened cutting edges. High leverage tools for heavy-duty use. Polished heads with plastic coated handles for added grip and comfort.